November. It's been here for twelve days already, and I've yet to give it the appropriate welcome. You'll find it standing just outside my door, arms laden with luggage full of fallen leaves most likely, softly tap-tap-tapping its foot as its waits with reserved impatience. Inside I'm running around frantically, with my hair in rollers and dirty dishes in the sink, not yet ready for its visit. Those dirty dishes were for good reason I assure you, I've been making apple tartlets. Not just sweet but savoury-ish, with a mound of goat's cheese the tuffet for thin slices of apple, enamelled bronze by thyme-infused honey. They are mostly a task of assemblage, with little to do but cut, stack, brush and bake, but the opportunity to get out a rolling pin makes it seems as though you've done a some cooking. A fine dusting of flour across the hands always makes me feel I've been productive. The tartlets came from the oven raised grandly at the edges, such is the miracle that is puff pastry. The layers of apple were curled and tanned lightly at their tips, finally adorned with ivory petals of Grana Padano. Though I'd intended something autumnal in spirit, this was almost downright festive. November, consider yourself greeted. We tucked into these for a mid-afternoon snack, as is, full stop. Nothing more was needed. But if you were so moved, a crunchy pile of lightly-dressed bitter greens would be suggested my addition alongside. But then, that would mean more dishes. A more savoury spin on a recipe from Bon Appetit. Even though I have scaled back the original quantities of honey and butter, I still had more than enough - in fact, there was an excess. If I had to offer a guess, I would think that 1/3 cup of honey and 1 tablespoon of butter would suffice, but I have included generous quantities below in the case of the desire of a more luscious result. 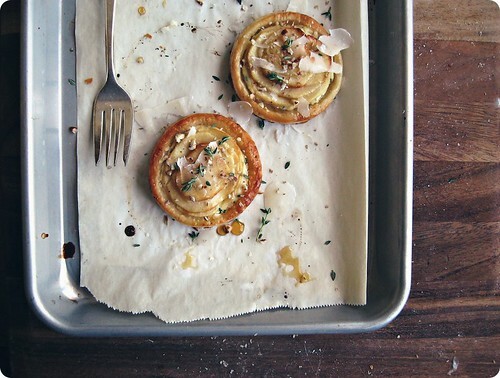 Line a rimmed baking sheet with parchment paper and set aside. If not ready-rolled, roll out the puff pastry block to a 9-inch square on a lightly-floured work surface. Use a 4-inch cookie cutter or ring to cut 4 rounds and place on the prepared baking sheet. Repeat with the second block, cutting 8 rounds total. Using the blunt end of a 3-inch cutter firmly press into each round, without going through, to form a border. Freeze for at least 30 minutes to firm up. Preheat an oven to 375°F (190°C). In a small saucepan over low heat, start to melt the butter. Once it's about halfway there, add 1/2 of the honey, the thyme sprigs and a pinch of salt. Stir gently until all the butter has melted and the honey is warm. Remove from the heat and leave the honey to steep while you get everything else ready. In a small bowl, stir together the goat's cheese and the vinegar, seasoning again with a pinch of salt. Peel, halve and core the apples, then cut into 1/8-inch slices. Remove the chilled pastry from the freezer and use an offset spatula to spread a scant 2 teaspoons of the cheese mixture within the demarcated border. Top the cheese with a stack of apple slices. Brush the honey butter mixture over the apples and sparingly on pastry edge. Bake in the preheated oven until the apples are soft and the pastry is golden and puffed, around 30 minutes. 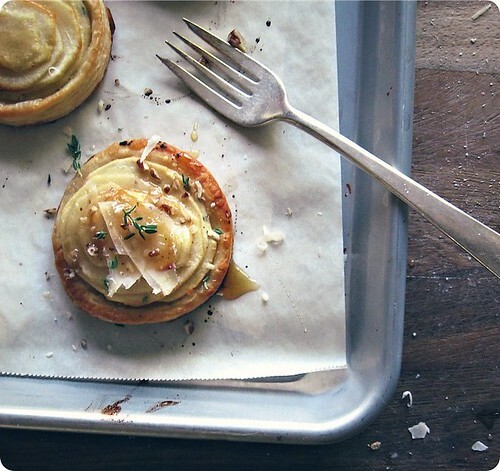 To serve, drizzle the tartlets with the reserved honey, the shaved Grana Padano, and some picked thyme leaves. Serve either warm or at room temperature. • In the photograph, I toasted a meager 4 or 5 pecans and (as my Grandmother would say) "bashed the blazes out of them" for a final, crunchy flourish. They're not essential, but make a fine addition. Walnuts would be tasty too. If you have them on hand, bash away. • Although I have not tried it, I am tempted to substitute a blue cheese for the goat's cheese, omitting the vinegar.